Hyperuricosuria is an inherited condition of the urinary system affecting several breeds of dog. The SLC2A9 gene codes for a protein that allows the kidneys to transport uric acid from the urine. Dogs with mutations in both copies of the SLC2A9 gene are predisposed to have elevated levels of uric acid in the urine, hence the name hyperuricosuria. Uric acid can form crystals and/or stones (uroliths) in the urinary tract. Dogs with hyperuricosuria most commonly present with symptoms of recurrent urinary tract inflammation, which include frequent urination, blood in the urine, and straining to urinate. They may also have loss of appetite, lethargy, weakness, vomiting and pain. Urinary stones in the bladder can cause urinary tract infections or more seriously, blockage of the Urethra. Both male and female dogs can be affected, but obstruction of urine flow is more common in males due to differences in anatomy. Although an x-ray can be used to exclude other types of stones, urate stones cannot typically be seen using x-rays and must be evaluated by ultrasound. Not all dogs with mutations in both copies of the SLC2A9 gene will have symptoms of disease, though they will have increased uric acid excretion in the urine. Genetic testing of the SLC2A9 gene will reliably determine whether a dog is a genetic Carrier of hyperuricosuria. 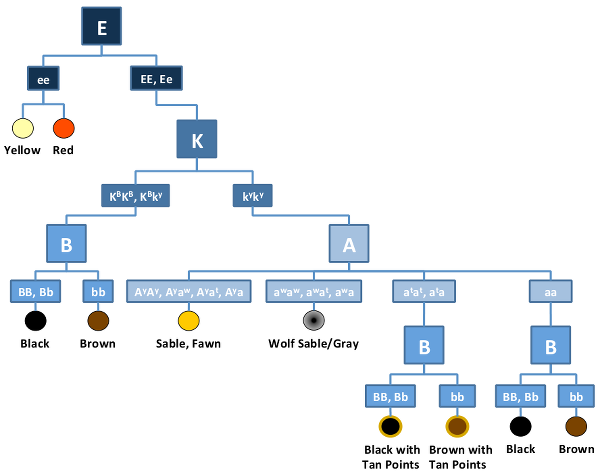 Hyperuricosuria is inherited in an Autosomal Recessive manner in dogs meaning that they must receive two copies of the mutated gene (one from each parent) to develop the disease. In general, carrier dogs do not have features of the disease but when bred with another carrier of the same Mutation, there is a risk of having affected pups. Each pup that is born to this pairing has a 25% chance of inheriting the disease and a 50% chance of inheriting one copy and being a carrier of the SLC2A9 gene mutation. Reliable genetic testing is important for determining breeding practices. Because not all affected dogs will have clinical signs associated with hyperuricosuria, genetic testing should be performed before breeding. In order to eliminate this mutation from breeding lines and to avoid the potential of producing affected pups, breeding of known carriers to each other is not recommended. Dogs that are not carriers of the mutation have no increased risk of having affected pups.